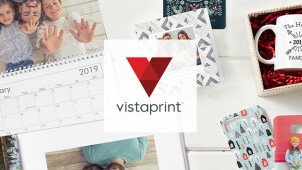 Up to 25% off Photo Gifts at Vistaprint Get a photo gift for a special someone and save up to 25% off your order. 50% Off Selected Invitations and Announcements at Vistaprint Design personalized invites for a special occasion at Vistaprint and save 50% off your order. $30 Off Orders with Friend Referrals at Vistaprint Spread a good wor about Vistaprint by referring the online store to a friend and get $30 off next order. One Month Free Trial with Digital Marketing Services at Vistaprint Enjoy testing digital marketing services for free at Vistaprint. The mission at Vistaprint is a straightforward one. This innovative Cimpress company wants to help you market yourself professionally. You’ve put a lot of hard work in, after all, so now when it comes to those business cards, flyers, brochures and much more to complement a huge variety of business models, you can let Vistaprint do the legwork while you enjoy a simple and seamless design process. Whether you’re looking to create a menu for a small pop up restaurant, or if you need some branding on t-shirts for an event - you really can go above and beyond your marketing expectations with Vistaprint by your side. Not just reserved for the business owner, Vistaprint is also where you can finally get creative with all those snaps you’ve accumulated over the years. Make your own birthday, or Christmas cards, find a gorgeous template for your ‘Save the Dates’ or create a wall calendar for a friend. With Vistaprint you can let loose with the fun personalisation options. For yourself, your business, a family member or for a friend - Vistaprint will see that every product is a delightful one. Choose a promotional code to copy and use the ‘shop now’ link to head over to vistaprint.com.au. Find your goods, click ‘get started’ to personalise them as you wish. Click ‘go to cart’ when you’re ready and enter your promotional code in the space provided. Apply it and continue to finalise your Vistaprint order. Sign up for simple savings by getting your email address onto the Vistaprint mailing list. Can I amend my Vistaprint design? To amend a Vistaprint order, you will have to request a cancellation via your account and then submit a new order. We’ll always aim to get you the best savings, however, you can find loads of bargains on the Vistaprint specials’ section. Can I track a Vistaprint order? Most can be tracked, under the ‘View Order History’ tab in your account, you will be able to select ‘track’ in the ‘actions’ column. Vistaprint will start working on your design as soon as your order is submitted, cancel your order via your ‘My Account’ page and the team will do what they can. Sign in to send Vistaprint an email. Vistaprint is a simple and fantastic means to market your business. No matter what size or how successful it may be, with a Vistaprint coupon you’ll be able to inject a little pizzazz into your marketing so that you can get noticed. Offering a variety of services, Vistaprint lets you personalise everything from deluxe business cards and event invitations to photo books and even your office mug. Get on board with Vistaprint Australia and get creative with a wealth of products today. Buy requesting a Vistaprint business sample kit, it's the perfect way to try out a wide range of products before you commit to making that investment for your business. Highly rated, this kit is completely free and includes both standard and deluxe business cards, invitations, flyers and more! With a complete selection of materials to touch and see for yourself, you’ll know exactly what to expect when you put your Vistaprint order in. Business cards can be the best way for you to hit the ground running. The perfect introduction to yourself and your trusted services, design yours or choose one of the quality templates available online using your Vistaprint promo code to let you save on professional looking designs. Whether you’ve got a small pop up business going or looking to jazz up some tired looking business cards, these Vistaprint creations are are sure to keep those clients coming.